From Sydney MacKenzie Knocks ‘Em Dead, available now. Combine broth and tomatoes in a medium saucepan over medium heat. When soup bubbles, stir in cream and reduce heat to low. Season with dashes of salt and pepper and simmer for about 15 minutes, stir it continually. 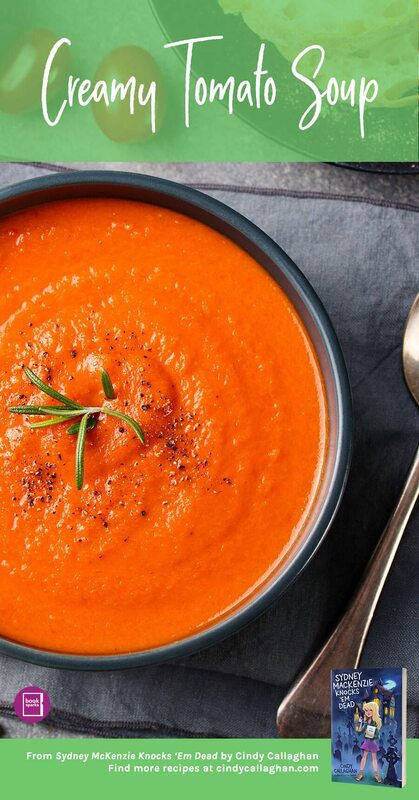 Puree soup in a blender – might want to hold blender with an oven mitt. This is so good if you top with melted cheese: Provolone, Asiago, cheddar, Gruyere, Swiss, etc. ; and serve with crusty bread.